Decide to go looking for some new jazz to listen to and what one might end up finding can translate to a cornucopia of polyrhythms, non-replicable solos, and-or instrumental fusions sometimes only best described as “something Herbie Hancock would do.” The potential for unexpected variety and the ways or places that variety can manifest on an album, are of vast option. What though, about an album that is rather straight forward in its conceptual and musical premise but catches attention for its unexpected cultural blends and a genuine matching enthusiasm for such? Ishi No Hoden is not from Japan. None of the personnel are Japanese. 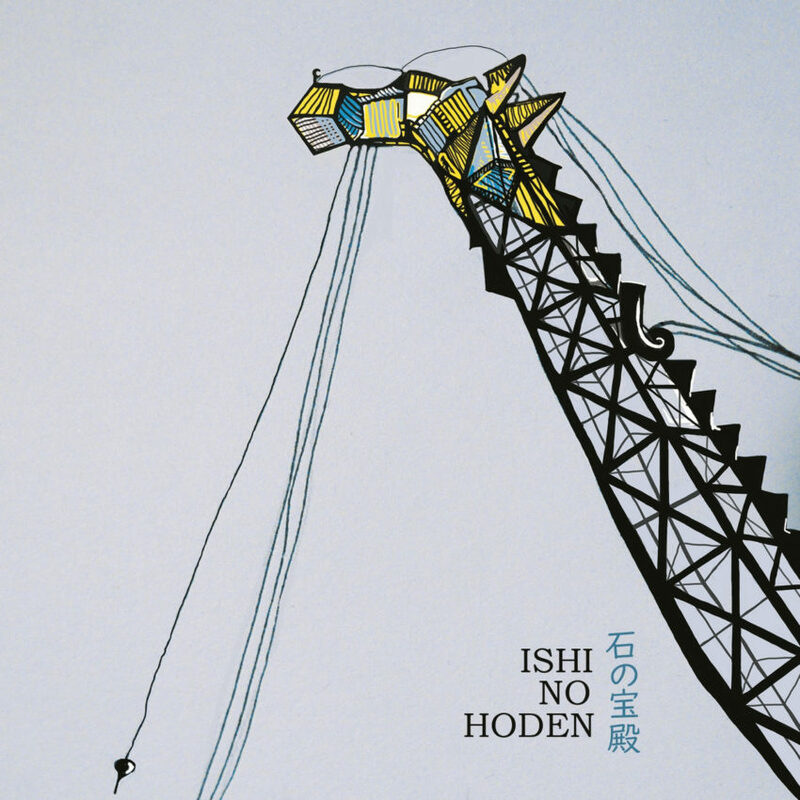 Ishi No Hoden is a seven person group based in Trieste, Italy. The modern jazz-centric band ticks multiple unexpected boxes by way of its very existence but past the surprising one-sheet details, this newly formed septet brings musicianship and strong arrangements to back up its atypical inspirational driver. The band’s debut self-titled record goes all in to positively illuminate the Land of the Rising Sun with contemporary, original compositions that evoke jazz-leaning rhythmic and instrumental choices alongside melodies and audio presentation that strongly evoke the sound style of traditional Japanese music and much of the folk writing and theatrical performances which it accompanies. Glancing from a distance, this is a pretty neatly packaged pursuit that really raises an eyebrow only out of sheer curiosity around the source of Ishi No Hoden’s very niche passion. Drummer, composer, and band leader, Camilla Collet, would be whom to turn to for answers on that front. In a brief video from July of 2017, speaking before a performance at Trieste Loves Jazz, Collet explains the band came together around the time of a finale exam during her three year degree and Ishi No Hoden’s unusual moniker is derived from the name of a multi-centuries old megalith of the same name, found in Japan. (The structure itself is shrouded in unknowns, with meticulous studies of the monolith revealing nothing about how or why it came to be in what is now Takasago, within the Hyogo prefecture.) Collet’s intrigue around the megalith’s history inspired the name choice and the subsequent decision to link present day jazz with traditional Japanese music was the product of a “strong curiosity” and “strong interest” she came to develop for Japan’s cultures, from practicing Judo for many years. Fascinating as the very premise of Ishi No Hoden is as a mere entity, the band doesn’t just fall apart once its musical execution is put under the spotlight. Equipped with a lineup of instruments that includes no actual Japanese instruments or application of any effects to best embody them, it would be easy to worry the eponymous album would fail to deliver a sense of balanced sonic fusion or that the attempts take on a caricature-like quality when presented through a saxophone or electric guitar. After all, settings like Japanese theater and imperial court ceremonies, where the country’s traditional sounds still thrive, have some very specific and heavily recognizable timbres from instruments like the three-stringed shamisen (common in noh or nogaku, mask-based theater) serving as primary vehicles for affecting what’s seen on stage. However, it’s the players’ cleverness with their own instruments that lead to a sincere and well-delivered homage. Right from the beginning of “Wabi-Sabi,” for example, the long but abruptly changing note tones played by Giorgio Giacobbi on soprano sax, are precariously close to evoking that mental callback to smooth jazz of the 1990s but the hard zig-zag play style, along with the minor interval and pentatonic oriented melodies at hand, align Giacobbi much more closely to thoughts of the traditional hichiriki. This application for emulation of a traditional sound across the album makes even more sense once one considers that the hichiriki is a reeded, woodwind instrument, though it bears a second reed that the sax does not. The swing back and forth between the jazz and Japanese dimensions of Ishi No Hoden moves freely as the album continues, with the seven track work fleshing out intricate sonic paths over lengths stretched between seven to more than 20 minutes on the midway piece, “Monogatari.” Halfway or so through “All Around Us” is a good example of where Ishi No Hoden opts (at least during parts of the 10+ minute piece) for a more contemporary jazz approach in rhythm, arrangement, and instrumental dominance but in the process of unveiling this, takes the listener through a gradual transformation from one side of the sonic character spectrum to the other, in a compositionally beautiful and seamless fashion. De Luisa’s piano playing is placed front and center at the start, evolving to include drum kit and bass, among other backing sounds, into the midway mark. The piece transitions from deliberately slow-paced and dissonant across very dense chords, to moving in melodically harmonious legato fashion around the pentatonic scale, to incorporating more syncopated rhythms and presenting a more contemporary arrangement – cymbal-based swing grooves and harmonized sax with trombone – heading toward the end. “Jita Kyōei” manages a similarly fluid presentation of Ishi No Hoden’s aspired blend but with the understanding that the song’s title translates to mutual welfare and benefit – one of the key ideals held by Judo founder Jigoro Kano and is intended as a key value in its practice – the more percussive-minded and energetic beginning brings out an additional layer of mental association, visualizing the very direct but controlled and refined sequences of the martial art form. Collectively, though Ishi No Hoden is an incredibly niche project, and though the pieces position themselves drastically outside of commercially practical length, what Collet has brought together doesn’t falter from these outlier qualities. Save for not being an ideal listen during short car rides, the actual artistic decisions behind Ishi No Hoden are not only thoughtfully made, but the cornerstone desire to connect contemporary jazz form with traditional Japanese musical art style comes through all five of the main elements to music: melody, harmony, rhythm, tone color, and form. During the course of each piece, Collet gave herself plenty of room to write narratives that would essentially allow her to address the “what,” (which instruments get featured) “where,” (at what point in a song does either style take priority?) and “how” (using what element of music will I reveal and-or indicate the prioritized style?) questions that surrounded her options for blend presentation in a flurry of compositional permutations over seven lengthy tracks. In this way, despite being so individualistic in its construct, Ishi No Hoden offers a surprisingly wide palate of inspired creativity while never straying off its conceptual course. And being the dense album that it is, this debut leaves lots to be explored, pondered, and reacted to, so, the potential for repeated and focused listens is virtually inevitable. Ishi No Hoden is available now via Bandcamp. Look for it soon on Spotify, iTunes, and YouTube.